Now that Riley is getting older and is much easier to travel with, we really need a stroller that would be able to keep up with our many activities. Our current stroller is bulky, heavy, cumbersome and takes up a ton of room in our truck. I knew there had to be better strollers out there which were more suited to our needs, but had never had the opportunity to personally sample a really high-quality stroller before...until now! 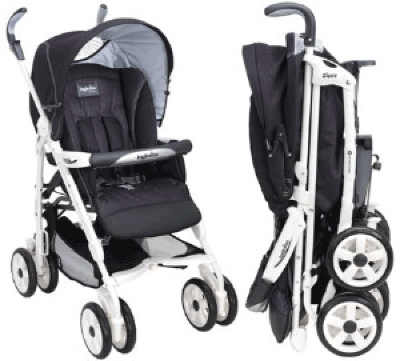 Inglesina is an Italian company that makes sleek and sophisticated strollers with a multitude of features, perfect for taking your tot almost ANYWHERE! They are so compact and lightweight that you won't bat an eye when it comes to traveling in either a bus, plane or even a tiny car, such as the Compass, Chicco Keyfit, Chicco Keyfit 30, and Peg Perego Primo Viaggio. Keep reading to find out what makes the Inglesina stroller different from any other stroller I've ever seen! I reviewed the Zippy Full-Size Umbrella Strollerfrom Inglesina, which retails for $379.00. First, let me start by saying that the Zippy stroller is made in Italy and also functions as an infant car seat carrier too. It is specially designed to work with any model of Graco car seat and comes standard with straps which will secure the Graco car seat onto the Zippy stroller's frame. Of course, it will also work perfectly with the Zippy bassinet, which can be purchased separately. As soon as I removed the Zippy stroller from its box, I was given quite a shock for it was almost completely assembled! I was dreading the tedious chore of assembling this stroller, for I have put some together in the past that took me close to an hour. But the Zippy came almost ready to roll right out of the box! There were only a few parts, such as the canopy and mesh basket, that needed to be installed by me. Yippee! It was very easy to open the Zippy Stroller. Simply push down on the lever located on the right handle and within seconds the Zippy was completely opened. Next, push down on the locking mechanism in back to secure the stroller and you are all ready to go! As you can see from the bottom right picture, the Zippy has front wheels which pivot 360 degrees for maximum maneuverability. They can easily lock in place if you wish by simply turning the wheels toward the rear of the stroller and pushing down on the lever on top of the wheel. The picture below shows the left wheel in the locked position and the right wheel in the full-motion or pivot position. I was super impressed with the handles on the Zippy stroller. So often, I find myself hunched over our current stroller because the handles are just too short. This makes long trips out with Riley very unpleasant because soon my back and neck usually begin to hurt. The handles on the Zippy stroller are adjustable and can be easily raised with just the touch of a button. The really neat thing is that these handles will also swivel inward too, which makes pushing this stroller even more comfortable and ergonomic! As you can see from the lower left picture, the Zippy stroller has a secure locking mechanism which ensures that your stroller will stay opened at all times and not accidentally fold up on you and your baby. In order to disengage this mechanism, simply push the red button and pull up on the handle right next to this button. There is even a large rear platform so that you can quickly maneuver the Zippy over bumps, curbs, other objects, etc. The cup holder that is included with the Zippy is actually a little too small to hold most American-sized beverages. I tried inserting a 20 oz. bottle of water or a 20 oz. bottle of Coke inside this cup holder and found that these two items would not fit. A 12 oz. canned beverage, a child's bottle or a sippy cup, do each fit well inside this cup holder though. The canopy included with the Zippy is very large and spacious! When fully extended, it will almost cover your child completely from the elements. This is very handy in our scalding Texas sunshine, so that Riley's fair skin will not get burned. The second picture on the right details what the canopy looks like if you push it back a notch. This position will still protect your baby well, but will also give them a little more visibility of their surroundings too. The canopy on the Zippy also covers the baby completely from the back too. In the bottom left picture, you can see how there is a large "peep window" so that the parent can see their child easily. On hot days, you can unzip this rear portion of the canopy, roll it up and secure it, so that the child receives maximum airflow and doesn't become too stuffy while riding about. I was also very impressed that the Zippy stroller comes standard with a rain cover! Installing it over the Zippy was very easy, for it only hooks on the stroller in a few places. Your child is well protected, yet they can still see their surroundings. When not in use, the rain cover can be stored in the convenient drawstring pouch that is also included. Because we are often swarmed by mosquitoes when walking outside here in Houston, I also plan on using the rain cover to shield Riley from these menacing bloodsuckers too! Finally, the Zippy is super easy to fold up and can literally be done using just one hand! All that you need to do is disengage the rear locking mechanism and make sure that your front swivel wheels are also in their locked positions. Then, simply push down on the button located on the right handle and within seconds, your Zippy stroller is ready to pack up. If you are taking this stroller with you on a bus or plane, there is even a sturdy handle on the side of the stroller, which makes it so convenient to carry! I am very pleased at what a well-designed and compact stroller this is! The only feature that I found missing with the Zippy stroller was a storage compartment on the upper part of the stroller and cup holder for the parent's drink, although the Zippy does have a large mesh basket underneath. I love having a convenient place on my stroller near the handlebars to house Riley's pacifier, my keys and cell phone, as well as a cup holder for a bottle of water for myself too. Unfortunately, these weren't present on the Zippy. What's the one feature on a stroller that you just can't live without? Disclosure: I received the Zippy Full-Size Stroller in Marina from Inglesina in order to facilitate my review. No other compensation was received. This product review is based on my own personal experiences with this item and is completely honest and objective. My jaw is dropping. Im in complete awe!!!! I have never seen a stroller with so many neat things.